Alright everyone wants to know what I am going to do with the zucchini blossoms, its just so simple, I feel like I am letting you down. It’s been since last October since we have had any, so of course the first time I use them is going to be my standard presentation….I have played with it, changed the egg dip, but I always come back to these little bites of heaven. When we were in Rome, we had stumbled upon this little restaurant near the mouth of truth. We went in and saw a couple next to us getting all this wonderful food brought out to them. That’s when I first saw zucchini blossoms. I asked our server if we could have the same assortment the other couple was having since I couldn’t find it on the menu. She told me they were friends of the chef and he has sent out the food to them……sigh….I said I understood, and thanked her for telling me. I don’t know if its the sad puppy dog eyes that got her, but she came back out and told me the chef would be happy to make it for us! (it must be a gift, and it only works with women, but I have gotten tables when none were available, free desserts and drinks….sigh). Anyway I forget my wife reads this too..lol….so as the course’s came out, so did the zucchini blossoms. Romans do make them a bit differently, a piece of anchovy, a little bit of mozzarella, and quick fried till golden…..a work of art! But while we loved them in Rome, at home we remembered we didn’t like anchovies all that well. So I started tinkering with them and decided upon just a cheese filling, and that seemed to do the trick…dipped in an egg batter and quickly fried in Olive oil, patted dry and served at room temp. Little bites of heaven! open one end of the blossom gently and squeeze a small amount of cheese into the blossom. Due not overfill, you want enough to almost fill the blossom not to make it bulge. Gently twist the blossom closed. (you may also make a small slit in the side of the blossom and fill it from there). Refrigerate the blossoms for about 10-15 minutes while you get the egg mixture together. Heat a large sauté pan and then add about 1/4 inch of olive oil to the pan. Lightly dredge stuffed blossom in plain flour, shake off excess. Dredge floured Zucchini Blossom in egg mixture, shed any excess egg and place into hot oil, continue the process till you fill the pan. Fry each side of the Blossom until golden brown, about two minutes on each side, the second side may cook faster, keep an eye on them. Place finished blossom on paper towels to drain off any excess oil. When all the blossoms are finished place a paper towel on top of the Flowers and pat dry. Serve the Blossoms at room temperature. My Blossoms didn’t hold up as well as usual, so I only stuffed them, I promise more recipes in the weeks to come. I saw the recipe for Courgette Gratin in last months BBC Good Food, it looked like a wonderful casserole, so I made a few adjustment to the recipe and I have to say it was delicious! 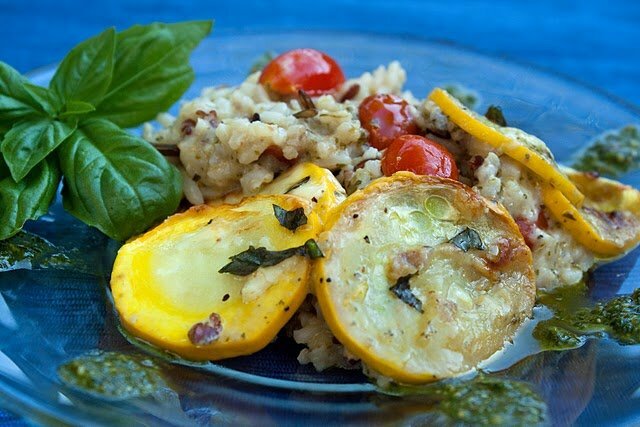 The squash stayed firm and the rice was so very flavorful, with the tomatoes adding a nice contrast the dish! I was lucky enough to find Sunburst Squash at the Market, a bright deep yellow with a green spot at the end. 1 Cup of Grape Tomatoes cut in half length ways. Place diced onions and Rice Blend in a 2 quart pot with enough olive oil to coat the rice. Allow the grains to sauté for about 3-4 minutes, you want to completely sear the grains, you may start to smell a nutty aroma. Add vegetable stock, and Pesto to Rice and mix thoroughly. Reduce the heat, stirring occasionally, until all the liquid is absorbed, about 20 minutes. Depending upon the grains you use you may need to add more stock or water until the rice is almost fully cooked. Rice mixture should still be wet. With the rice off the heat, add in your Greek Yogurt, and tomatoes. Pour mixture into a small baking dish, rice should come almost to the top of your baking dish. Top the rice mixture with most of your shredded cheddar cheese (save about 1/4 cup for the top), then place the squash slices overlapping each slice as you go. Sprinkle remaining cheddar cheese on top of squash and season finished dish with sea salt and black pepper. Place in a 350 degree oven for 20-25 minutes, until the top is golden brown. Sprinkle with chopped Basil or Italian Parsley. I had some of my zucchini flower stuffing left over and a Graffiti Eggplant in the Refrigerator, so thought, why not……hmmm, stuffed Eggplant Rollantine’s. Slice your eggplant into long slices, about 1/8 inch thick. leave the peel on the edges just trim off the top and bottom skin. You can either grill your eggplant slices or gently sauté them in olive, about 2 minutes per side. If you choose to grill them lightly coat them in olive oil. Place the slices on paper towels and pat dry. Take your ricotta cheese mixture from the zucchini blossoms, and spread 1 tablespoon of the mixture on each eggplant slice. 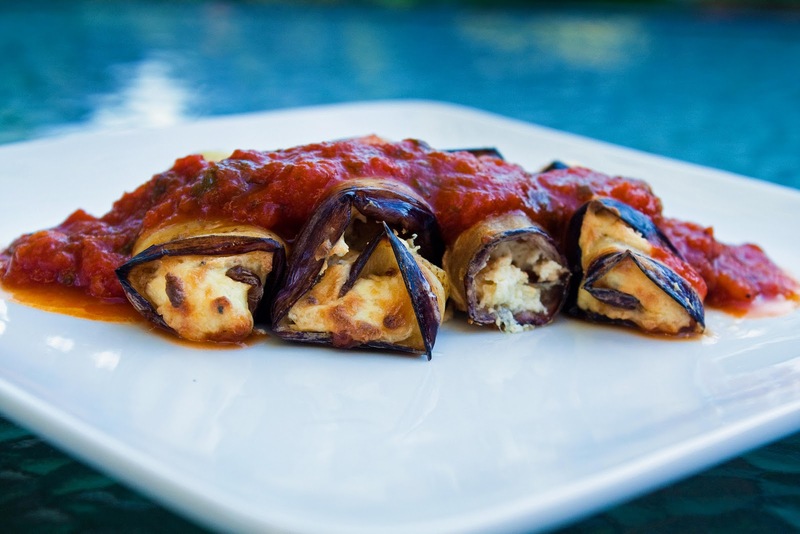 Roll the slice up and repeat with the rest of the eggplant. Place rolls in a baking dish and place in a 350 degree oven for 20 minutes. 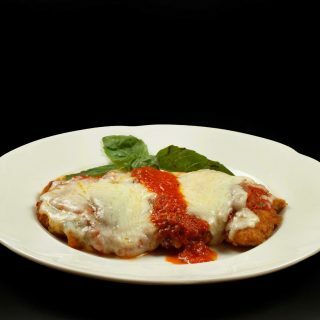 Top with your own Marinara sauce and serve. Now its not Vegan, but it is Vegetarian…….I can give up meat, but not cheese……ooooohhhhh the Wonder of Cheese. But on another note, today at Wegman’s I purchased Organic Raw Agave, Virgin Coconut Oil, Organic Shortening, and Silken Tofu……now I just have to figure out what to do with it……sigh…..baby steps. Hello! Thank you for your obsession with these blossoms! I have been wanting to try these for a long time. I just don't know where and when to find them. I do have a recipe you may be interested in for the zucchini blossom. If you would like it let me know. Also do you send your post by email? What a beautiful dish (your gratin). I am enjoying your wonderful dishes and beautiful photography. I only wish I was a young girl again so I could go through your food line! Wow, Chef Dennis, your entry is like Eggy's usual offering, multiple dishes! Can't think of any veggies that say summer more than tomatoes and zucchini! Very colorful and nice, esp the gratin, going to try that one myself, thanks! Can't do vegan either, I loves me some queso!!! PS: Just became a facebook fan! 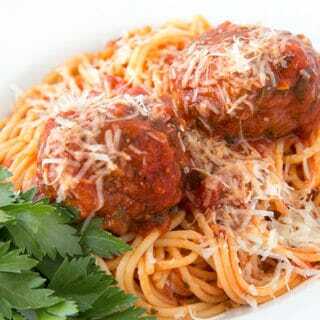 Join my page too if you want La Diva Cucina. Ciao and great post! Impressive is right. I will most definitely try that stuffed zucchini blossom recipe. Very impressive work ! The post, AND the blog in general ! I just love these dishes, and your mouth-watering photos! Great entry for the Smackdown. I'm hoping to post results this weekend, but we'll see. Thanks again for playing! 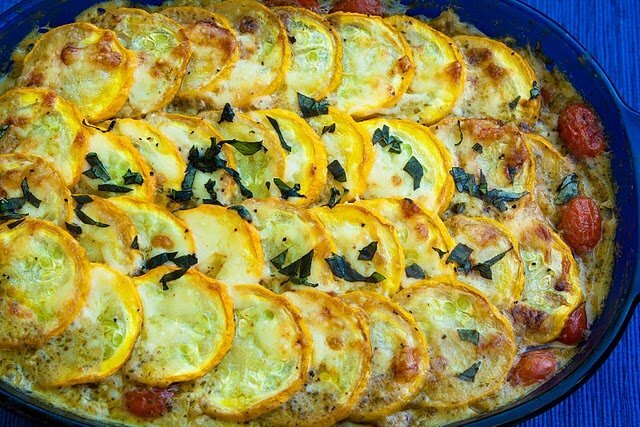 Those zucchini blossoms look just delectable, I love them so much and the gratin looks so yummy as well. Gorgeous pictures. Thanks a lot for you comment on my brownies b&w. I have answered to you on the post. Please to meet you, Dennis! I want to paint that glass pitcher.. Your food is simply gorgeous! Thanks for passing by and for the nice comment! 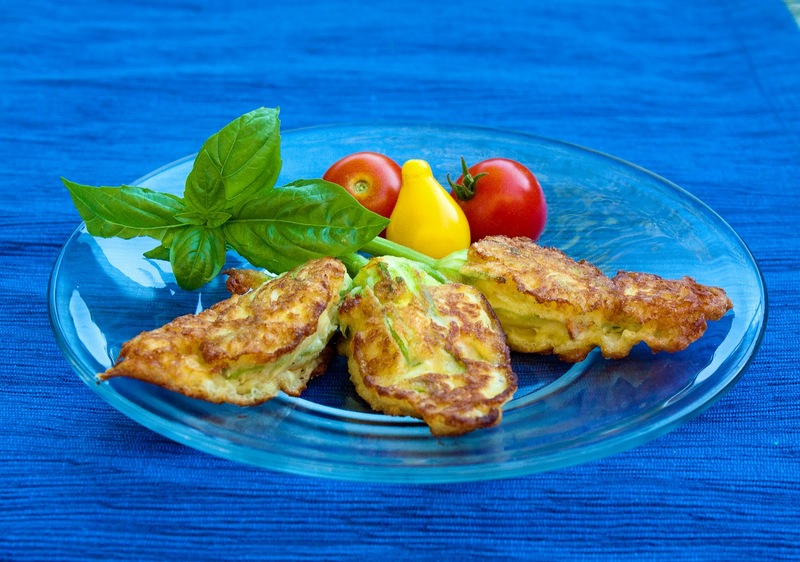 Zucchini blossoms are so delicate and delicious, I would love to try your recipe, right now! The pictures are beautiful, too! So lovely and equally delicious-sounding. My zucchini have finished, unfortunately, so no blooms, but I'm awash in eggplant, so I'm looking forward to giving the eggplant recipe a whirl. Brilliant, each one of them. Oh my goodness! That looks to die for! The Zucchini Blossom Dish that you have prepared seems to be awesome and I will prepare one if and when I get my hands on some Blossoms. In India too we prepare a similar kind of fried Blossom dish with Pumpkin Blossoms. Thank you very much for visiting my blog and encouraging me. I would be posting my experiences with Local Delicacies as and when I would be visiting various places. I shall be happy to welcome you and your kind comments/suggestions in my blog. It would be my pleasure to follow you and learn from you. While all of the dishes look amazing…I'm totally wishing I had some of the zucchini blossoms right now… I love your stuffing and your batter…gorgeous!! I am obsessed with your blog!! All of your recipes look just incredible and I cant wait to try some out! It sounds like you truly love what you do – how wonderful! Looking forward to reading more! Oh, I love zucchini blossoms and make the the same way, only using Greek cheese like feta, graviera or halloumi. However, my mother used to make them stuffed with rice, just like dolmades but without the minced meat. your food and photos are scrumptious! thanks for visiting food for thought, i see you love to read, cook and take pics, that means you MUST JOIN US! you have all the traits to have fun, its every other saturday, please join in, it would be great to have you! LOL! It was the sad puppy-dog eyes that got you zucchini blossoms! Very cute story Chef. I am sure I've never seen zucchini blossoms in the store before. It must not be popular in these parts. I so want to try your cheese filled recipe – sounds wonderful! Gorgeous gratin, just gorgeous. My vegetable garden has zucchini blossoms and I have always shyed away from baking these cute little stuffed flowers. Thank you for the inspiration. 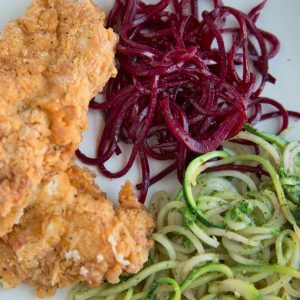 These zucchini blossoms seem to be all the rage over the blogger's waves! I have made them in a similar way recently and they were so delicious. Looking forward to more recipes and ideas! Beautiful and delicious. You have the best job. Thanks for sharing. I hate to admit that I have never had zucchini flowers. I am usually so excited to see the blossoms on the plant, envisioning future dishes using the squash, that I completely forget that I could be eating the blossoms. They sound particularly good stuffed with that cheese. YUM!! Thanks for visiting my blog all the way over in Africa – it's nice to 'meet' you & to have found your blog, too …. your recipes are wonderful and your food photos – mouthwatering ! I love zucchini and zucchini blossom in all kind cooked….. Thank you for visiting my blog, see you soon!! The more that I look at these….the more I want to try them! What great recipes! I have not had zucchini blossoms before. Could I find them at a regular grocery store? Sometimes zucchini blossoms are available at our farmers' market and I'm hoping that's the case this Saturday. I know there will be squash and I'm really wanting to do your casserole. 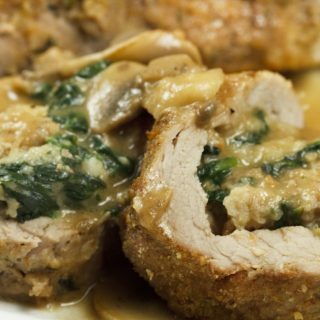 Thanks for a great post and recipes. I had not heard of those before but they look divine, truly divine. Sad to hear the steps toward vegetarianism… just kidding. 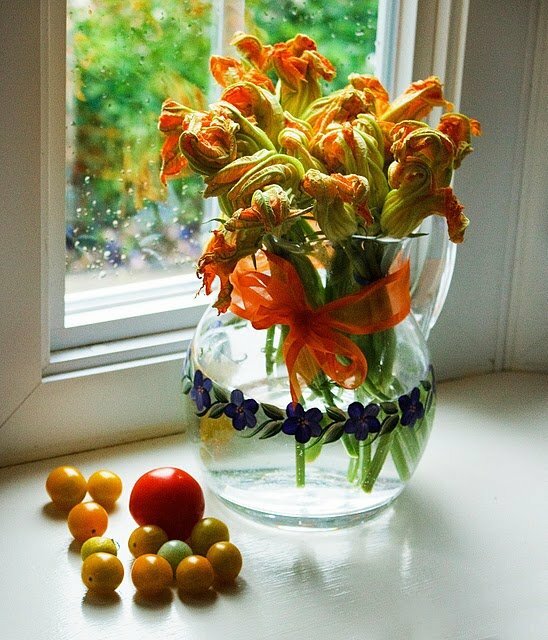 If someone gave me a bouquet of zucchini blossoms like your picture I believe we would be friends for life. There is something magical that happens in the short period of dropping the blossoms into the oil that is oh so delicious. Such a wealth of recipes and no, you certainly have not let anyone down with these treats. Btw – I LOVE the picture of the zucchini blossoms by the window. Are those raindrops on the pane? Lovely…. Dennis, Dennis, Dennis, do you ever tire of being brilliant? Oh my gracious! It all looks and sounds AMAZING! So, where do you get zucchini blossoms? I don't think I've ever seen those at Kroger. My garden didn't work out this year. Everything died. I have a black thumb. Would they have them at Whole Foods? That might be worth a trip to Whole Foods if they do. Just printed off your recipe… cant wait to try it!! AWESOME pics BTW! This is the summer I'm FINALLY going to make stuffed zucchini blossoms! Yours look splendid – and the rest of the recipes too! I had no idea you could eat zucchini blossoms. I guess you learn something new every day, eh? Great pics! I heart zucchini blossoms. I have not been brave enough to try them on my own yet.. I've only gobble them up in restaurants!! You make them look easy!! I am always amazed at what beautiful things can be done with zucchini blossoms. But for me, the big revelation is the gratin! Those lovely yellow slices are gorgeous! Wow, I'm the 100th comment! And no wonder… gorgeous photos of beautiful blossoms and the resulting creations. I've eaten zucchini blossoms but never prepared them myself – even tho there have been summers where I should have sacrificed some blossoms. Definitely at the top of my list of dishes to make myself! Those zuchinni blossoms look so delicious!! I wonder if I can pick them up at the Union Square farmers market..definitely gonna look for them! These are perfect, I love it! Ack, could've bought those blossoms from my farm yesterday but didn't know what to do with them. Next time! I love your blog by the way. The food looks so colorful, healthy and fresh. Can't wait to follow some of your recipes! I have never tried zucchini blossom. Love the flavors. I would love to try this dish if only I could get my hand on the blossom. Wow, so interesting! This is the first that I've heard of cooking zucchini blossoms. Makes me wish I had planted some in my little garden. Maybe next year . . . Your photos are fabulous! Such crisp, vibrant colors. This is why I wish I actually grew zucchini! I have a soft spot for fried zucchini. YUM! and the courgette gratin looks absolutely delicious! Thank you for your kind words on my blog!! Ma quante ricette favolose, la mia mamma ha nell'orto gli zucchini gialliadatti alla tua ricetta. Bravo chef. Ciao Daniela. Dennis, I'm touched! I use whatever type of lense is in my little Sony point and shoot. I think luck is 98% of my photography process. I figure I'll start coveting a real camera once I figure out how to maximize the potential of this one. Fate? I just stumbled across zucchini flower at the store yesterday for the first time this year…I was about to hunt for a recipe but this one won over my heart! I'm intrigued by these little zucchini blossoms. I've never tried them, but I have heard they are fabulous!! Hunting some down this week! 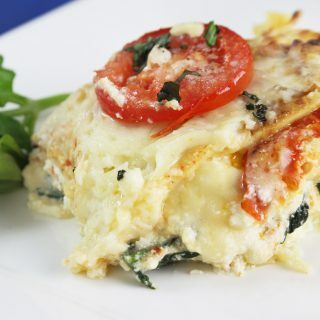 Wow beautiful gratin… It sounds yummy! I love zucchini flowers, too. They're so healthy, delicious and nutritious. Fantastic recipe. Very good presentation as well. Thanks for sharing this sir. Everything looks outstanding! I keep looking at our farmer's market for the squash blossoms. If I ever fin them I'll know just what to do. Your Courgette Gratin is beautiful. I just finished dinner and I'm ready to dig in. I've never cooked with zucchini flowers but I'm intrigued! They seem very tres chic. I did want to say that I am the daughter of a retired home economics teacher who spent her entire adult life teaching kids how to cook. 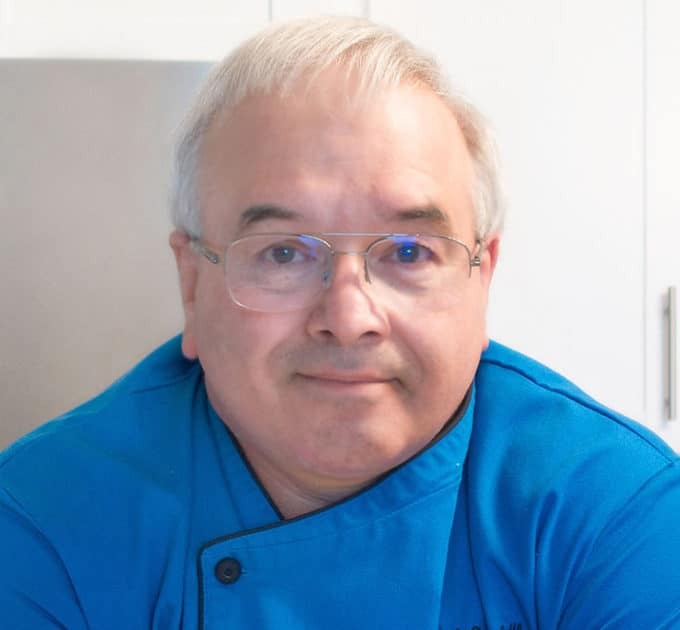 It is where my passion the kitchen (and sewing room) come from, and I hope that some of your students can carry on the torch of food knowledge that you are passing to them. Cheers. You've just killed me with those recipes, wow they look amazing. Tomorrow I'm also planning to do some experiments with zucchini for my blog. I have to try the stuffed zucchini recipe u posted, I never tried zucchini flowers and I really really want to know how they taste. Unfortunately I've never seen them in any grocery store. Maybe farmer's market has some. dennis these look DIVINE! simply divine I say – I have only made squash blossoms once, and I stuffed mine with an orzo, cheese and herbs – but have been working on one with some GREEN CHILE, cheese and a spanish rice concoction for my fusion cookbook – well, working on it in my head that is, haven't played with it on the stove yet, but when I do I will post….meanwhile, these are so gorgeous and the gratin -oh my…oh my oh my oh my, i am such a zucchini and squash lover this is something I MUST TRY – it will give me something else to indulge in beside my calabacitas recipe variations and my veggie tacos (post coming soon lol) – oh…and the eggplant rollatini… YES YES YES!!!..BRAVISSIMO!!!!!!! 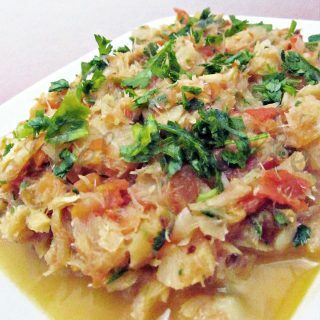 one of my favorite eggplant dishes EVER! These look wonderful and I've never even heard of them! I'm going to have to keep my eye open for them. These dishes look amazing. I'm so glad you commented on my blog so I could find yours. How unique and inspiring. I'll be back for sure!